Website navigation should never be larger than 9 items. People can only remember 5-9 chunks of new information at a time. 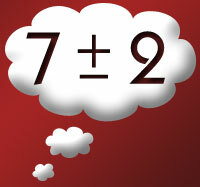 Do you know that it has been scientifically proven that the average human can remember 7 plus/minus 2 chunks of information? George A. Miller, who has a PhD in Psychology from Harvard University, first expounded on the idea in his paper "The magical number seven, plus or minus two." He has found that most people can store 5-9 chunks of information in their short term memory. Consequently, we are able to process 5-9 pieces of new information at a time. Now, you are probably saying to yourself, "I can remember more than 9 things at a time." This is because you have combined smaller chunks into larger chunks of information. Take for example the pledge of allegiance of the United States. Notice the natural chunking of information. Each of the smaller chunks of information, each word, has been combined with other smaller chunks to create a larger chunk, a line. This allows us to store larger and larger chunks of information. This idea can be directly applied to all methods of presenting new information. Break the idea into 5-9 logical chunks. Then elaborate on the logical chunks with 5-9 meaningful and supporting ideas. Think about web sites that you have visited that you can navigate easily. I would bet that they have followed the 5-9 rule. With every site that I create, I try to make the navigation no larger than 9 items. If it is larger than 9, it gets divided into smaller, closely related groups. Conversely, I've seen sites where you search and search for the link to what you want because there are just too many links. I'm sure that you could think of a couple also. I'd be willing to bet that there are more than 5-9 links. You can use this rule in all aspects of business life. Employee Instructions: Only give them five to nine things to remember. This principle can be utilized everywhere you turn and you will begin to wonder how you ever lived without it. Should Sound be Used on a Website?